Since I moved in here, I’ve had the pots and pans stacked haphazardly on the stove, the counter, anywhere I could find space. About a month after I moved, I tired of the kitchen related chaos and went to the evil Swedish store and bought a pot rack. Then, I got distracted. I don’t know why. I guess I saw something shiny. Or a martini. Either works. 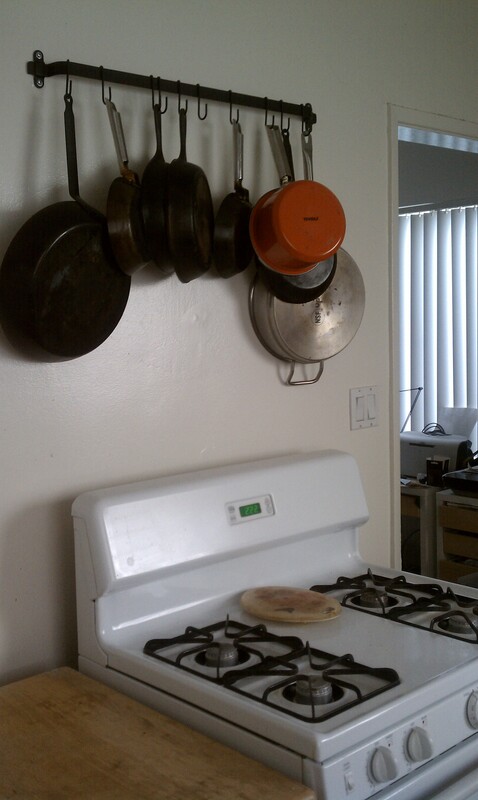 This weekend I’d finally had enough – I was going to install that rack and hang those pans if it killed me. Since I’ve got lath and plaster walls, I went to the trusty hardware store and bought some toggle bolts, as all my cookware hanging on the wall might be a bit heavy. The first two holes went well. I drilled a 3/8 inch hole, popped in the toggles, and all was happy. Then, on the other side, I pounded in a nail to guide the drill bit and the nail got stuck. Somehow, I never associated this with there being a stud there, I just kept trying to drill the hole. When I didn’t break through, I figured I’d just push in the toggle bolt anyhow, hoping that somehow the space behind the wall would magically appear, which, of course, it didn’t. That, my friends, is pots and pans hanging on the wall from a rack. And all I really needed was two long hard screws. And washers.